Endangered Wildlife Trust in South Africa ran a series of print advertisements in 2009 featuring the remains of deceased albatross chicks who had been fed junk by their parents. “If you don’t pick it up they will”. “Ball”, “Bottle Top” and “Lighter” together won a Silver Pencil in the 2010 One Show for Newspaper or Magazine Campaign and a Bronze Pencil for Outdoor Campaign. “Bottle Top” won a Silver Pencil for “Outdoor Single”. 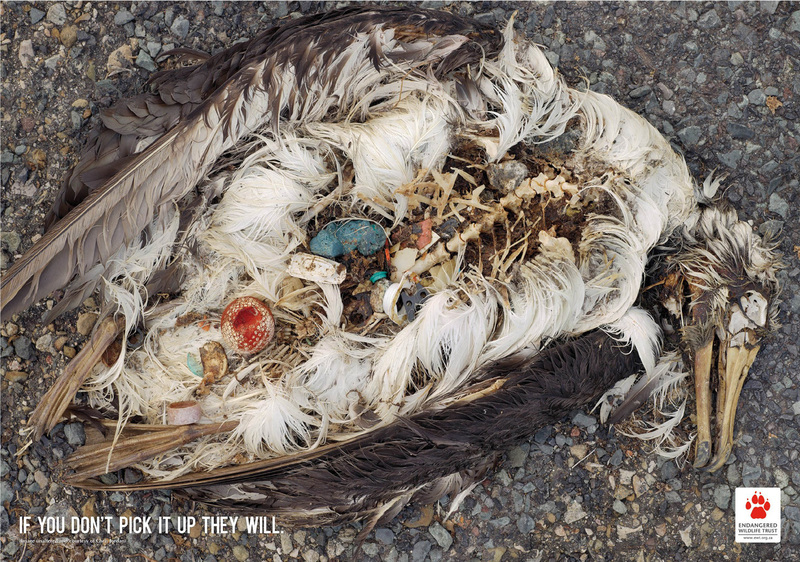 The Trash Seabirds campaign was developed at TBWA\Hunt\Lascaris, Johannesburg, by executive creative director Damon Stapleton, creative director Adam Weber, art director Wihan Meerholz, copywriter Jared Osmond, senior account director Bridget Langley and account manager Katiso Maarohanye. The Trash Seabirds series is an adaptation of “Midway: Message from the Gyre”, produced by photographer Chris Jordan. Jordan’s photographs of albatross chicks were made in September, 2009, on Midway Atoll, a tiny stretch of sand and coral near the middle of the North Pacific. The nesting babies are fed bellies-full of plastic by their parents, who soar out over the vast polluted ocean collecting what looks to them like food to bring back to their young. 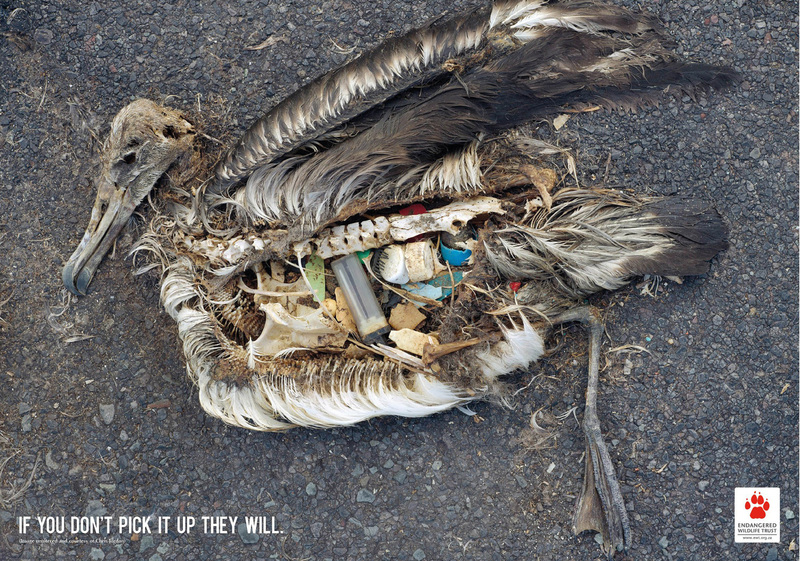 On this diet of human trash, every year tens of thousands of albatross chicks die on Midway from starvation, toxicity, and choking. To document this phenomenon as faithfully as possible, not a single piece of plastic in any of these photographs was moved, placed, manipulated, arranged, or altered in any way. 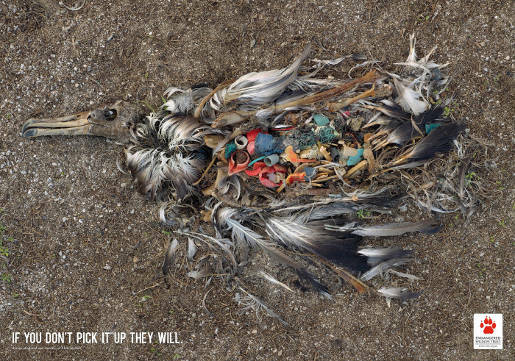 These images depict the actual stomach contents of baby birds in one of the world’s most remote marine sanctuaries, more than 2000 miles from the nearest continent.